Black Friday is known as a day of great deals and Aveda Florida beauty schools are no exception. We will be allowing guests to spin our wheel of fantastic prizes when they purchase one of our AVEDA gift sets. On top of that great deal we are giving all guests a free $25 gift card for every $100 gift card purchase! Here are some student blogs giving a little insight into what would make great gifts this holiday season. Give the gift of relaxation!! As a student I think that it would be great for everyone to come to Aveda and get an energizing massage. I have met a few people out and about in the community that have been feeling a little down because of the stresses of the holiday season so I told them about the cool things going on at Aveda, and told them to come on in. Well they came to Aveda and are now in love with the results they saw. It was like night and day, their attitudes where 100% uplifted and they were ready to take on this holiday season without a worry in the world. It made me feel great knowing that even though I wasn’t able to go home for the season I was able to bring someone else joy which in turn made me fall in love even more with massage. Because of Aveda the joy of my life has been found and I want to share it with the whole world. HAPPY HOLIDAYS!!! 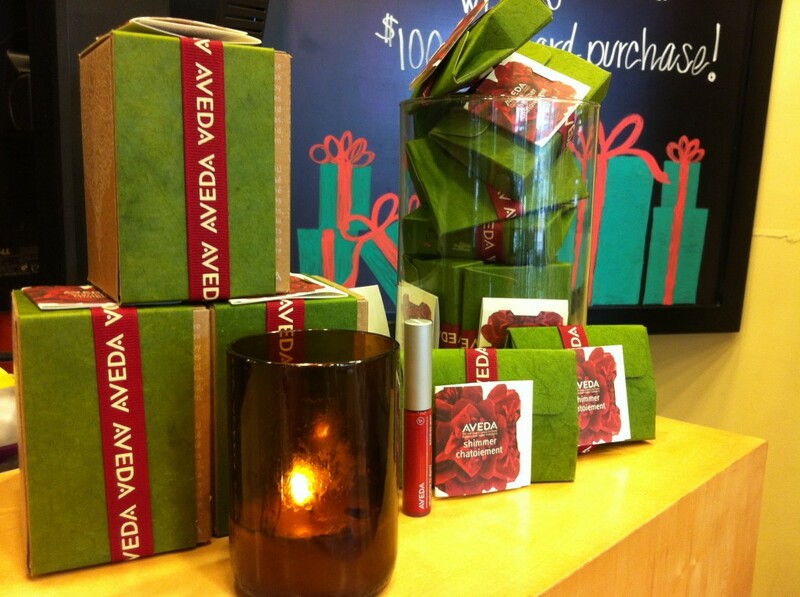 During the Holiday seasons, we have our AVEDA gift sets in stores NOW!! We have so many of them to chose from. Anything from our stress fix body lotion and bath salts, to our Damage Remedy hair care line. Some gift sets are available in travel sizes as well, creating the perfect stocking stuffer! We also have our new Aveda soy candle called Warmth. The aroma reminds me of winter at it’s best, you can also use the wax as a moisturizer for your hands. Simply light the candle, let burn, then tip some wax into your hand. Then simply massage the wax into your hand and fingers. Happy Holiday’s! Come to Aveda and see what Santa’s elf’s are making. The Gift set is such a nice gift for anyone you know Male or Female. We also, have alot of stocking stuffers to offer during this season as well. I love the NEW Scented Candle – makes me think of Christmas Morning sitting by the fire drinking Hot Coco. I have sold over 3 gift sets and I would recommended them all. Aveda offers only the BEST from all the REST! We are the Future and WE LOVE what we do! Share some JOY this year buy a gift set and Give the GIFT OF AVEDA! Happy Holidays!